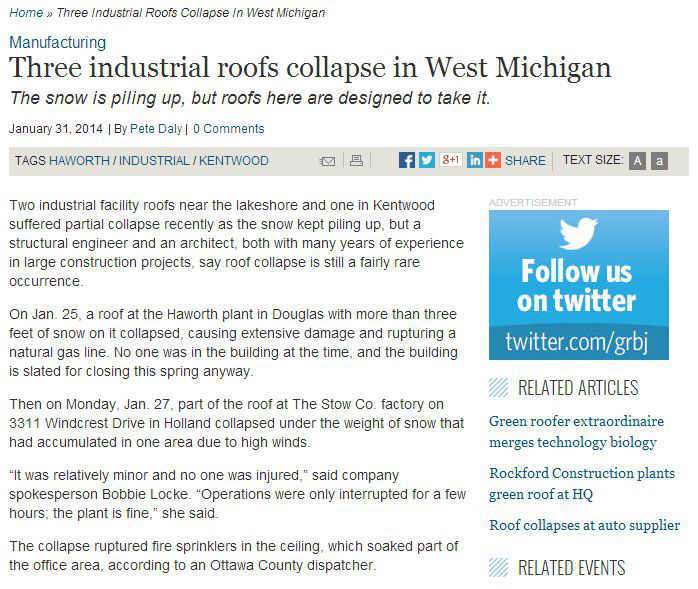 Two industrial facility roofs near the lakeshore and one in Kentwood suffered partial collapse recently as the snow kept piling up, but a structural engineer and an architect, both with many years of experience in large construction projects, say roof collapse is still a fairly rare occurrence. On Jan. 25, a roof at the Haworth plant in Douglas with more than three feet of snow on it collapsed, causing extensive damage and rupturing a natural gas line. No one was in the building at the time, and the building is slated for closing this spring anyway. 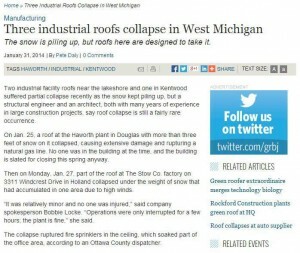 Then on Monday, Jan. 27, part of the roof at The Stow Co. factory on 3311 Windcrest Drive in Holland collapsed under the weight of snow that had accumulated in one area due to high winds. Metal roofing, for instance, is one of the most durable options available. Aside from the fact that it lasts for decades, it is also wind resistant and can hold a lot of weight. The weather is impossible to control and a strong metal roof can protect against pretty much anything that the sky can throw at it. It also gives you an assurance of longevity, eco-friendliness, and minimal maintenance. Every homeowner should invest in a quality roof that can withstand gale force winds and torrential downpours. However, it needs proper installation and the right materials with an appropriate understanding of your environment to help keep your investment secure. The formation of ice dams, for example, can weaken your roofing system so you need to hire reliable roofing companies in Michigan that can comprehend your needs. Michigan roofing companies like Kroll Construction know what to look for and can help you decide on the best course of action to take if you plan to replace your roof, whether you use metal, asphalt, or fiberglass composites. It doesn’t hurt to invest in a program that will help you fix the small issues before they can develop into bigger problems.